My son is a quadriplegic spastic cerebral palsy 5 year old boy that has little to no mobility. 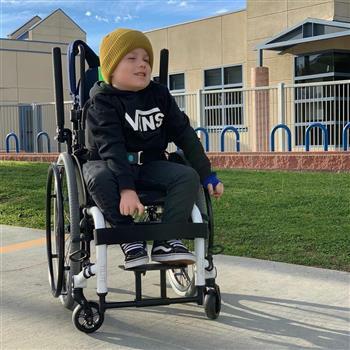 He has hypotonia so he does not sit independently so he will greatly benefit for an adaptive bike. He uses one at school and absolutely LOVES it, he has the time of his life on it. Loves to be outdoors and feel the wind against his face while in anytime of past movement. Praying over this perfect handsome to be cruising around in his new bike! anything to help little man!!! We need to keep him cruzing in style! Best of luck getting Maddox this bike. Good Luck! Love You All!!! You deserve this bike little love. ❤️ Hope we can ride the neighborhood with your new wheels! The Deezy family wishes you the best of luck on getting the bike Maddix! We can’t wait to ride with you Maddix!